The Agilent 7100 Capillary Electrophoresis instrument delivers quick separations with unmatched resolution for challenging LC analytical applications. The newly designed Agilent HPLC offer unparalleled LC sensitivity to a broad range of Chromatography applications. Moreover the Agilent CE system brings a variety of Electrophoresis LC techniques to a wide range of analytical and separation challenges making it a multipurpose machine. The Agilent 7100 CE boosts sensitivity with extended light path of capillaries and is the most sensitive capillary electrophoresis system on today’s market. The software comes with tools needed for regulatory compliance and audit trails. 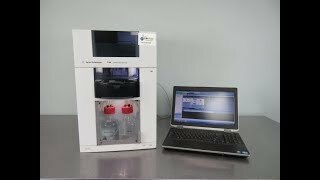 Another cool feature with the Agilent 7100 Capillary Electrophoresis Instrument system is plug and play connectivity to any Agilent Mass Spectrometer system. Connecting a Mass Spec and setting it up for the first time can often be a daunting experience, but with the ease of Chemstation software, this Agilent CE Machine does all the hard work for you. Simply connect your Agilent Mass Spec, turn it on and the software will automatically detect which MS system is being used. Due to the versatility of this CE Machine, separation science is virtually limitless with the Agilent 7100 Capillary Electrophoresis system. Looking to run capillary electrochromatography, no problem this system does it all. It even includes a built in autosampler allowing for unattended operation which increases throughput and productivity within your lab. This Agilent HPLC has it all including a built-in safety feature for leak testing and a vial sensor. Toggle with vial pressurization with its built in programmable pressure system. The Agilent 7100 CE allows you to program from -100 to +100mBar on inlet and flushing with 1 bar, or high pressure 1-12 bar. The Agilent Technologies 7100 can accept three types of vials including 100µl, 1ml, 2ml and uses a high speed forced air cooler with Peltier component for its Capillary cassette. This systems was built off the ever popular Agilent G1600CE and has more features than you’ll know what to do with. Contact us today to learn more about our Agilent 7100 Capillary Electrophoresis Instrument. This Agilent 7100 Capillary Electrophoresis just went through Agilent's maintenance protocol and is in excellent condition, a complet diagnostic report is provided. All of our lab equipment comes backed with our standard warranty. Should you have any questions, please don't hesitate to contact us.